Welcome. I am so happy that you stopped by. 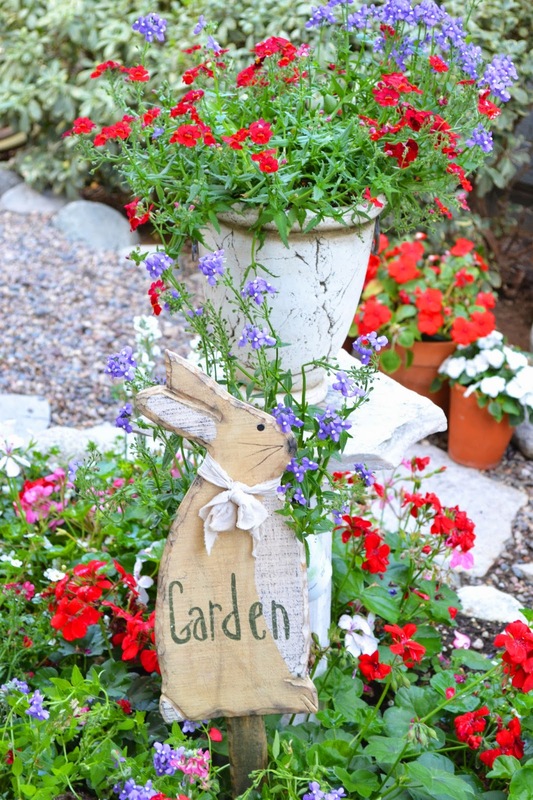 My garden gate is always open for you to come in and sit and relax with a cup of tea while I share with you some fun and fanciful Spring and Easter creations that our Eastside Art Gang created at our monthly gathering. 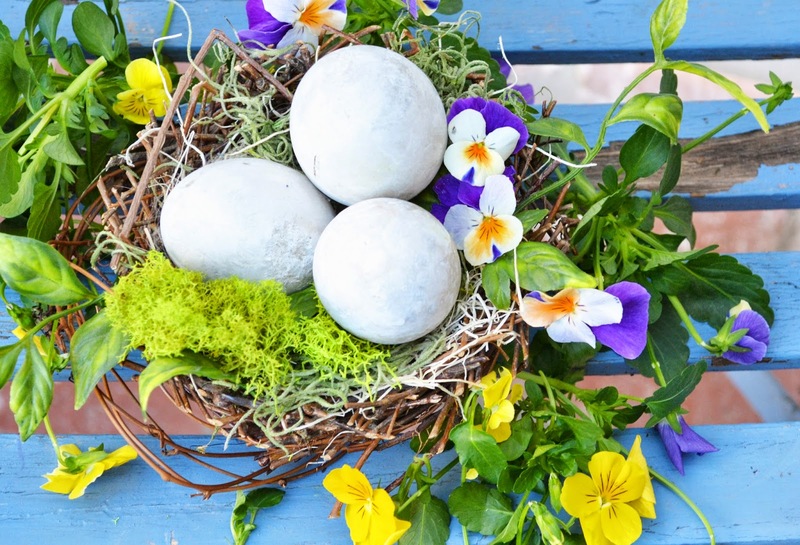 We spent a lovely day in Jody's beautiful garden learning to make concrete Easter eggs, nests and embellishing flower pots to hold the eggs and nests. 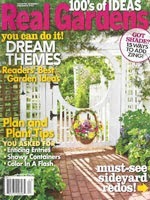 Her walled garden is lovely and the perfect place to create. Jody demonstrated making concrete Easter eggs . We choose to use rapid set concrete rather than plaster. 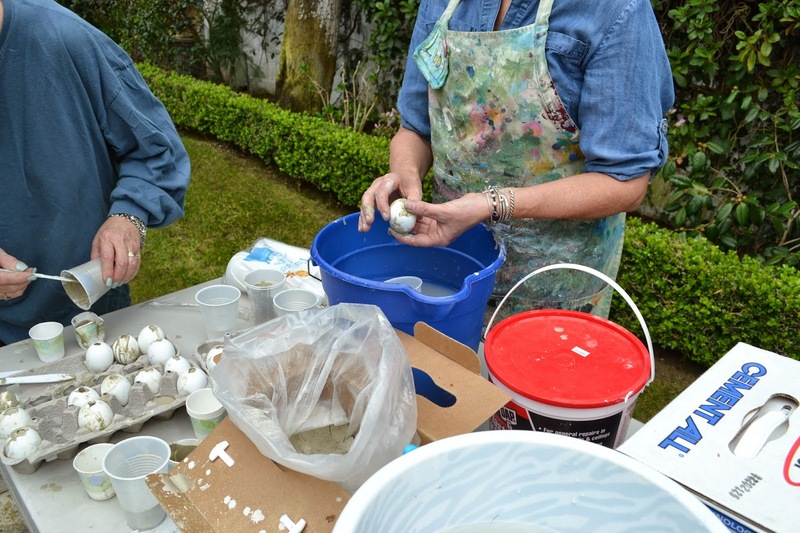 First we mixed the rapid set concrete with water until it was a thin enough consistency to pour into the emptied eggs and set them aside to harden - about 3 hours. 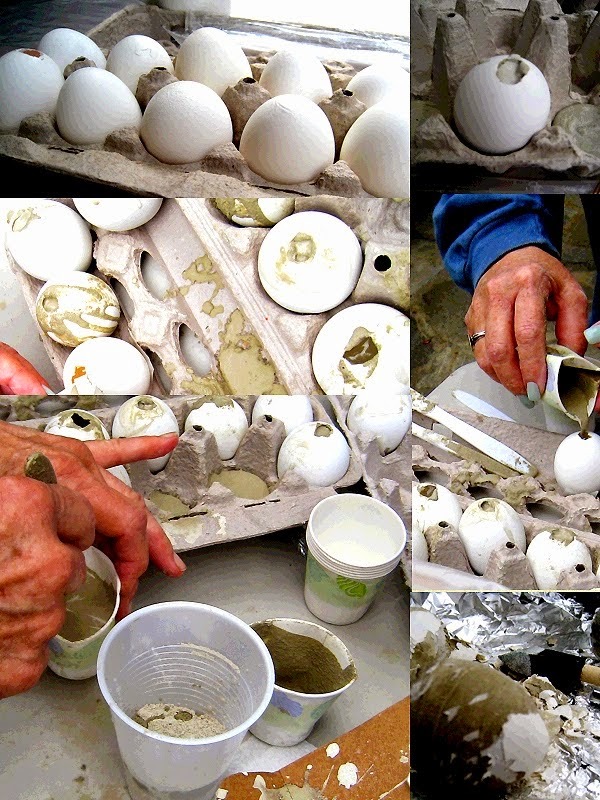 When the concrete was hard we peeled off the shells to reveal the eggs. Jody shared a number of amazing techniques to use on our pots and taught us how to make nests from grape vines, twigs and various kinds of moss. 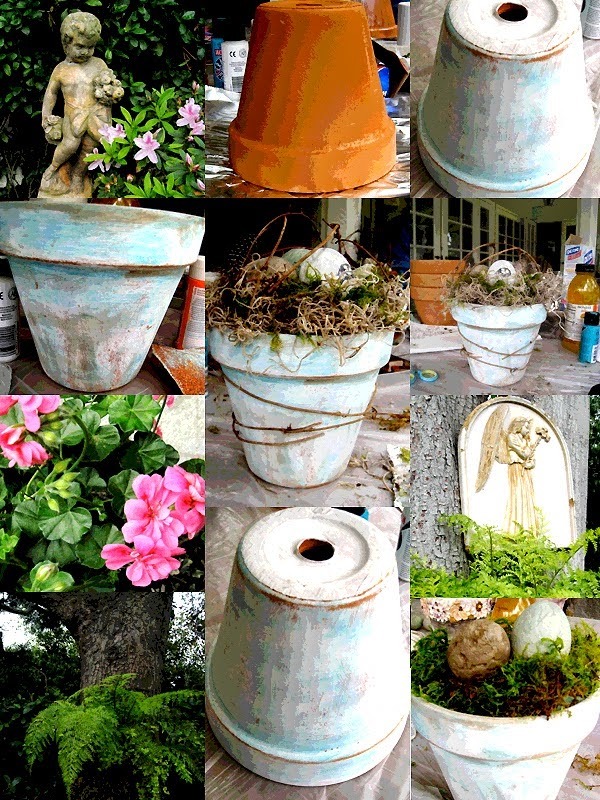 Some of the artists embellished their pots with plaster and painted and distressed them. 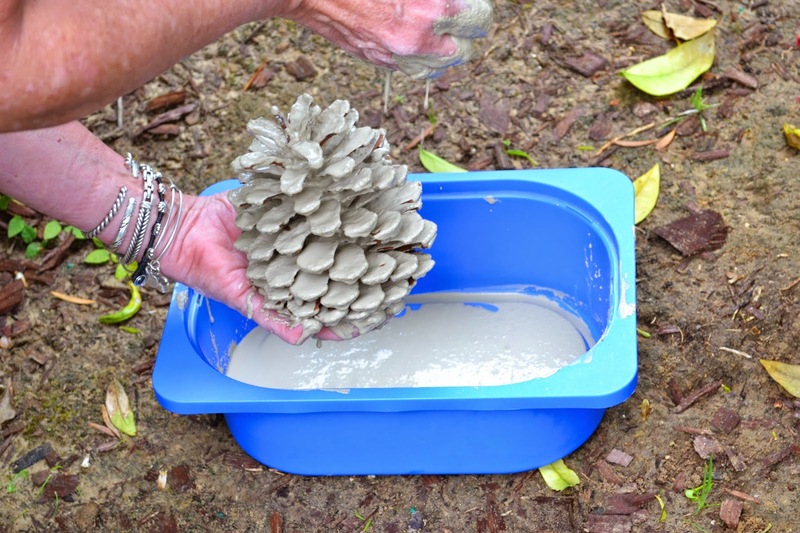 Libby covered a pine cone with concrete for a very interesting effect and some of us tried making concrete leaves. 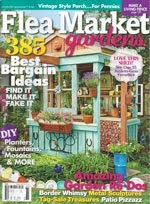 I borrowed Jacki's photo to show you her lovely turquoise pot. Jacki also took the photo of my pot and Linda's - you can see that everyone created something a little different! 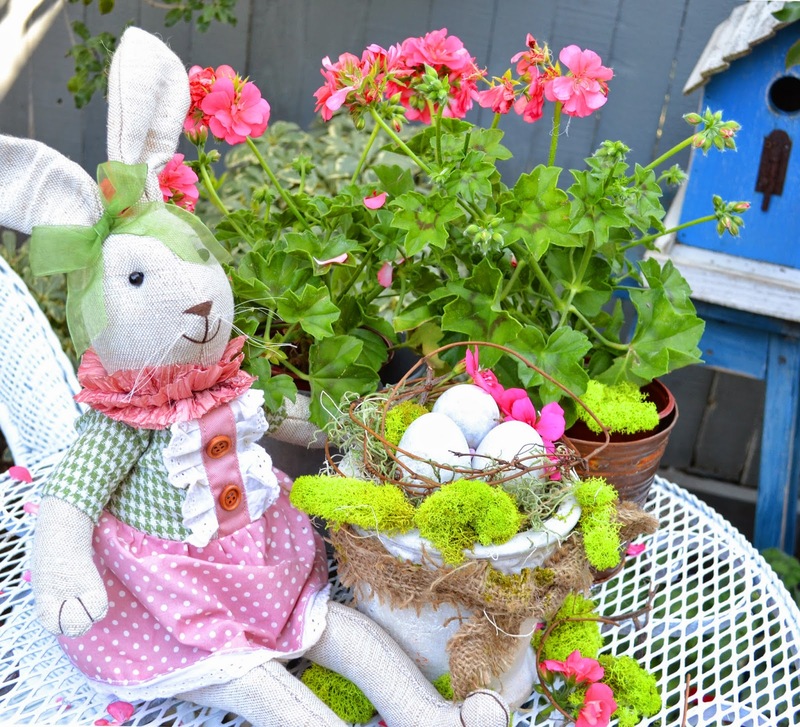 Let's leave Jody's garden and head back over to my garden where Bentley, my Studio Assistant is waiting to show you more of the eggs and nests that I created for our garden. Concrete eggs in a nest. Thank you for stopping by. 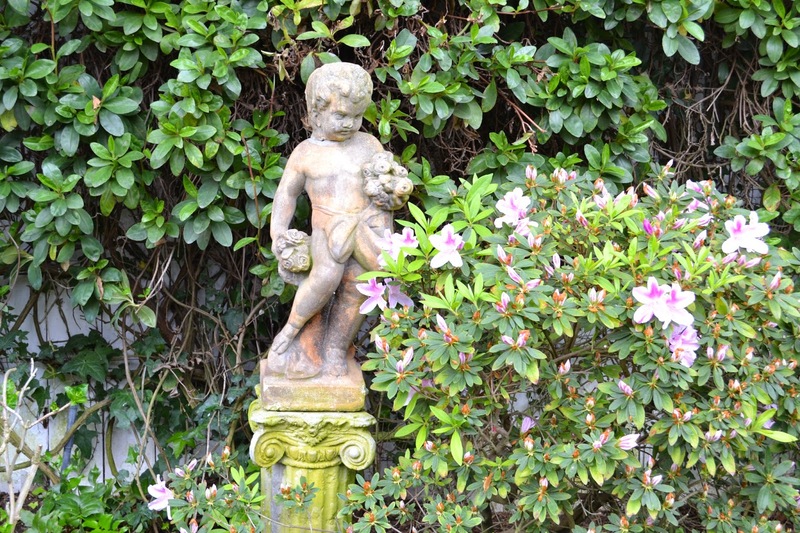 I sincerely appreciate your visits, e-mails, comments and those of you following my blog - welcome to my new followers. 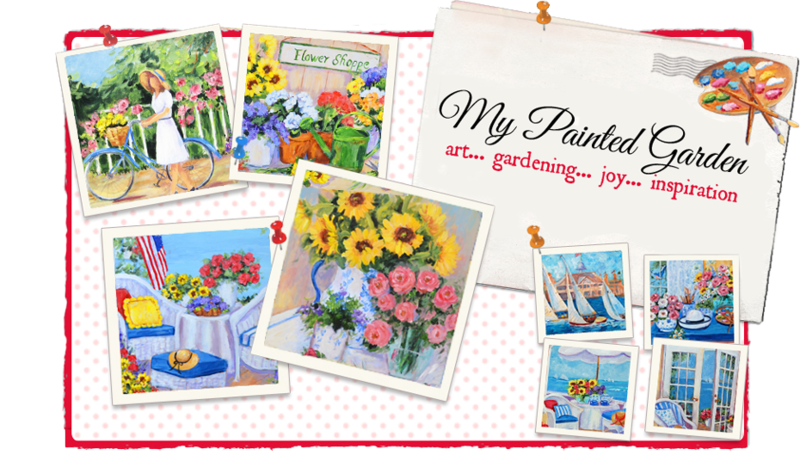 I will be taking a blog break for a few weeks to work on new art for the Balboa Island Art Walk in May and will be back with a Spring garden tour after Easter. Erin, beautiful blog and a wonderful post. 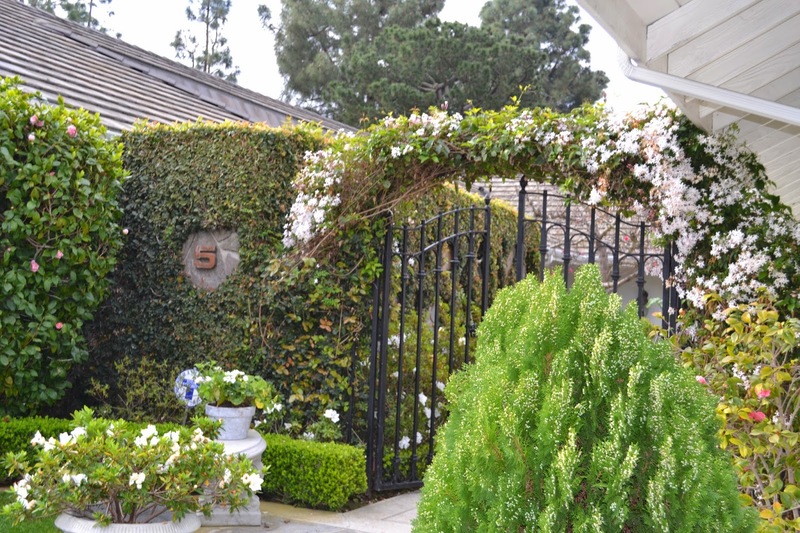 Your photos made my yard look so lovely, thank you. 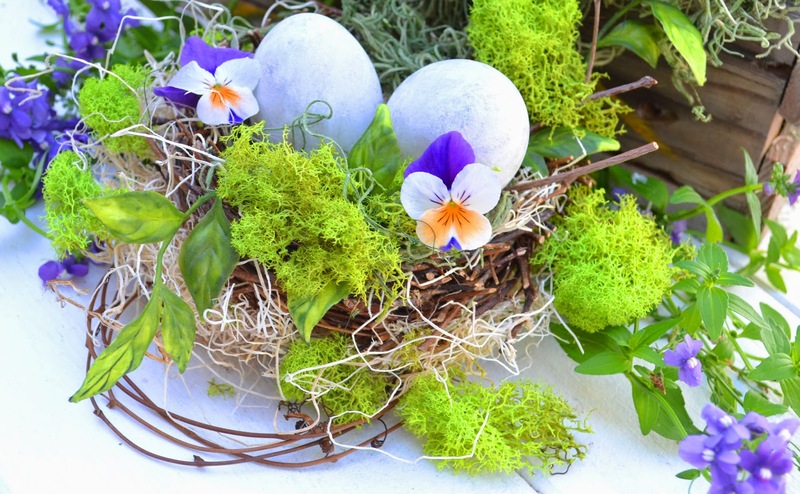 Love, love all your delightful nests~ and such cute eggs! You have inspired me to finish mine. 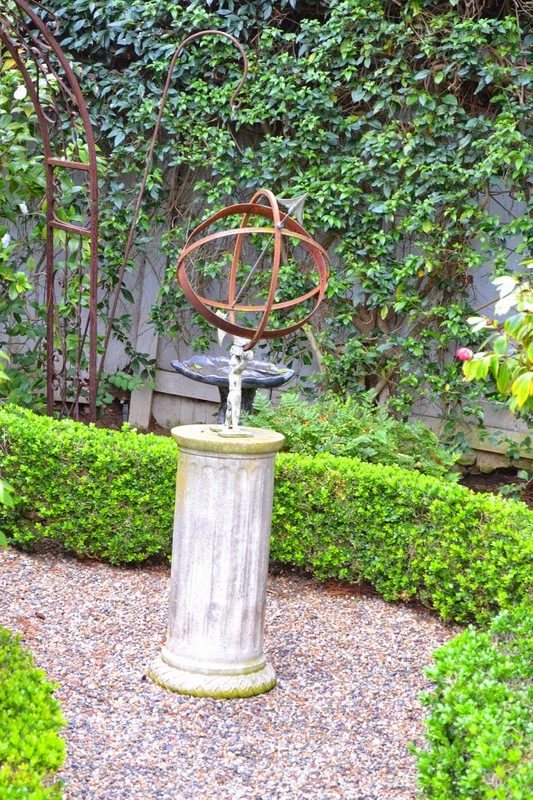 The garden is looking lovely this spring. 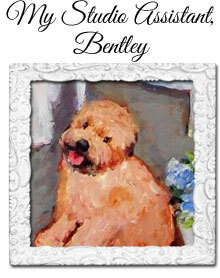 Bentley is a dedicated assistant and I hope he gets a bone from the butcher as a bonus for all his work. You are a great photographer ..I could take lessons from you, and learn a lot I see. Bet you they were fun to make. 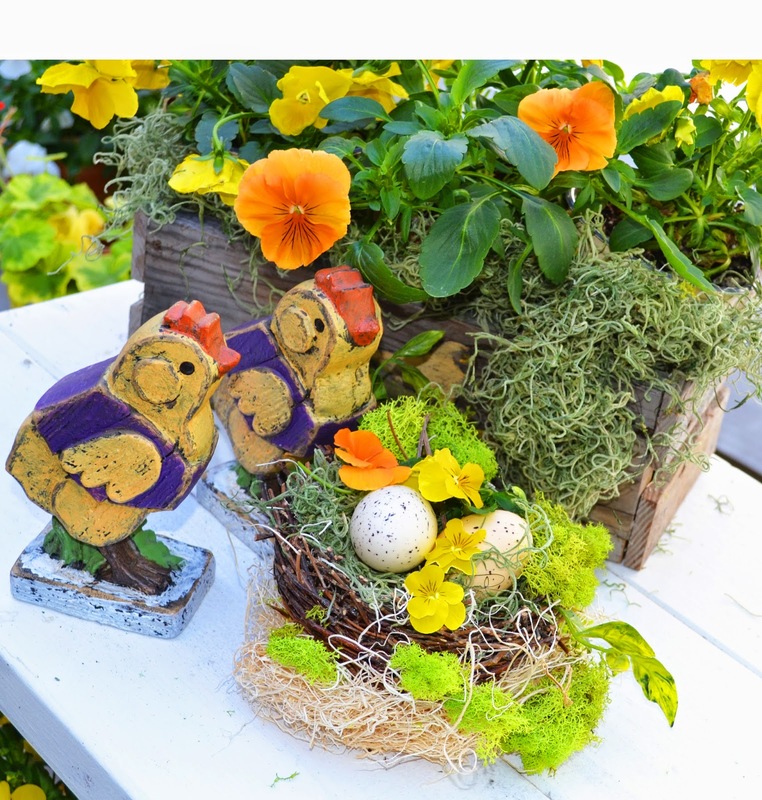 I love the pots, eggs, nests and all the other accessories you have with them. All so pretty. 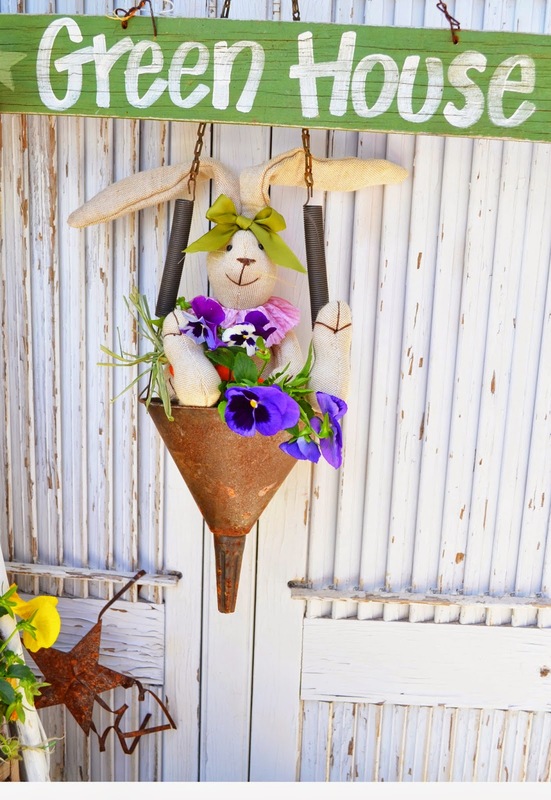 Lovely Easter decorations. Erin, everything is so pretty and it looked like you girls were having fun making eggs, nest and all sorts of loveliness. 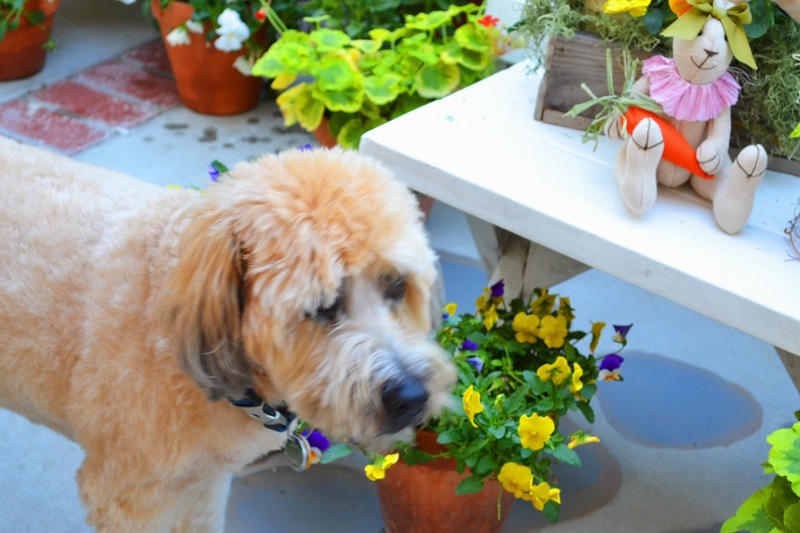 Bentley looks so proud of your breathtaking garden. 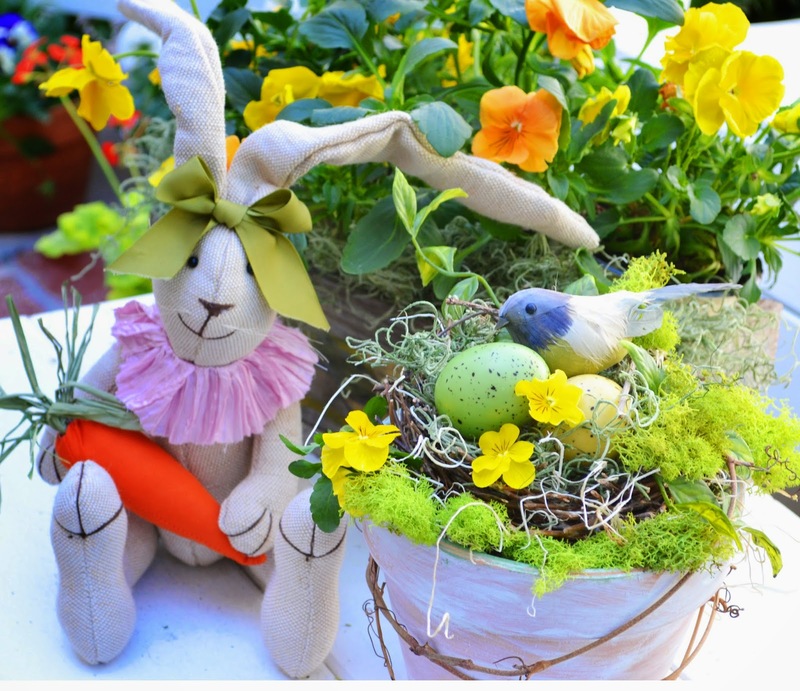 Have a wonderful Easter and good luck on your art show. Hi, Erin...how pretty these all are.I know that you had so much fun with all the ladies. 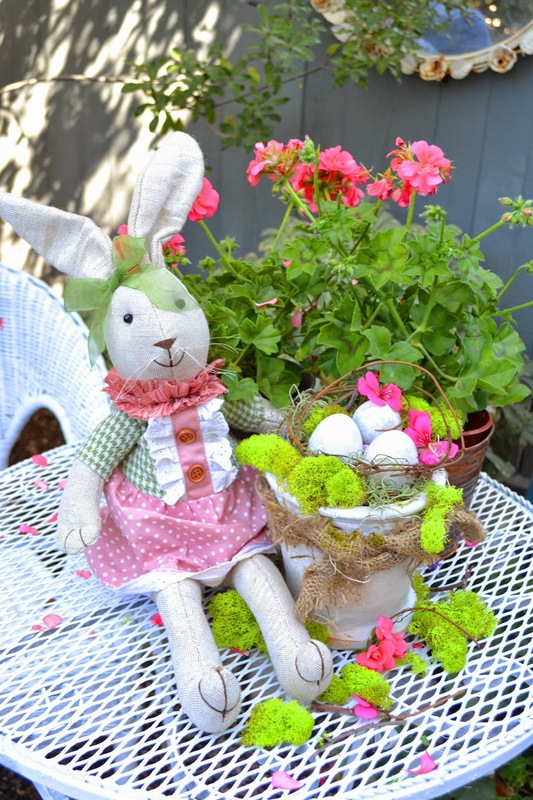 This post makes me want to get all my Easter decor out and start decorating. I have my hand surgery on March 19. The doctor says I will be good to go pretty quickly. I am hoping we can get together sometime soon if your legs are doing okay. 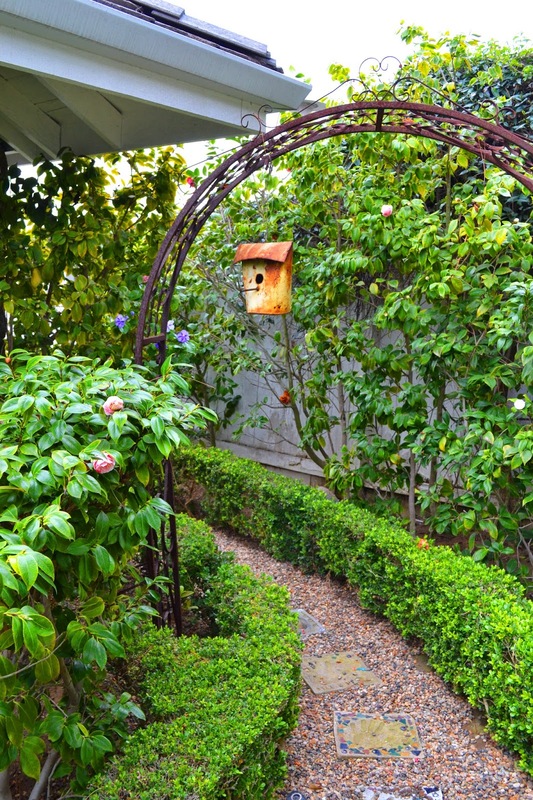 Thanks for sharing Jody's garden it is beautiful. 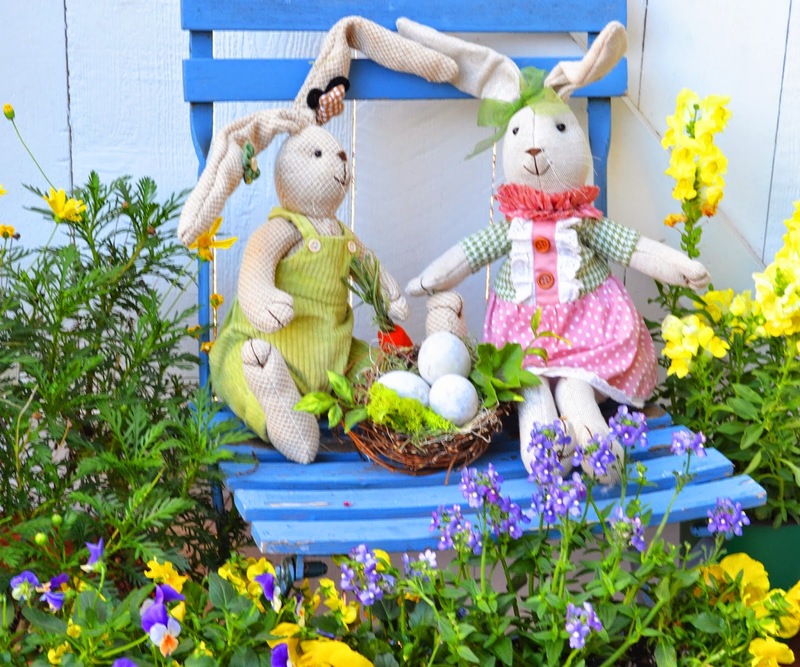 Love all the things you made to make your yard so festive. 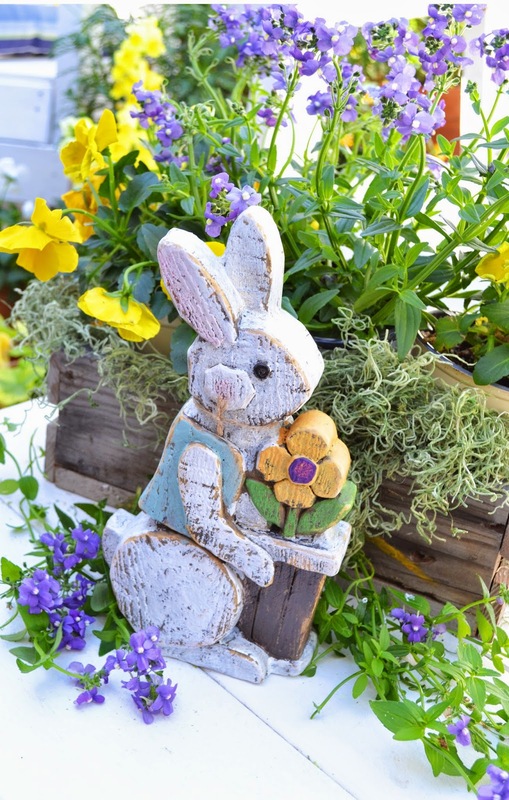 I really like the wooden bunny with the flower. So cute.... Have a great show. You and Bentley have a wonderful Easter. 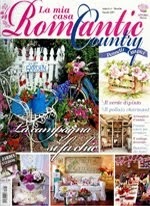 I am having a give a way over at my cozy site if you would like to enter. Wow, what fun. I love the eggs and how the pots came out. Thanks for sharing!!! 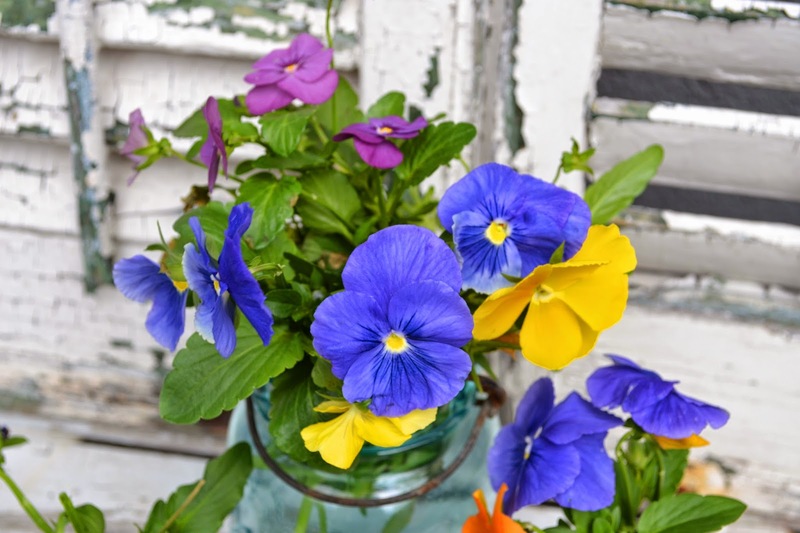 Such gorgeous flowers, so colorful and spring-like. I am so ready for warmer weather!! 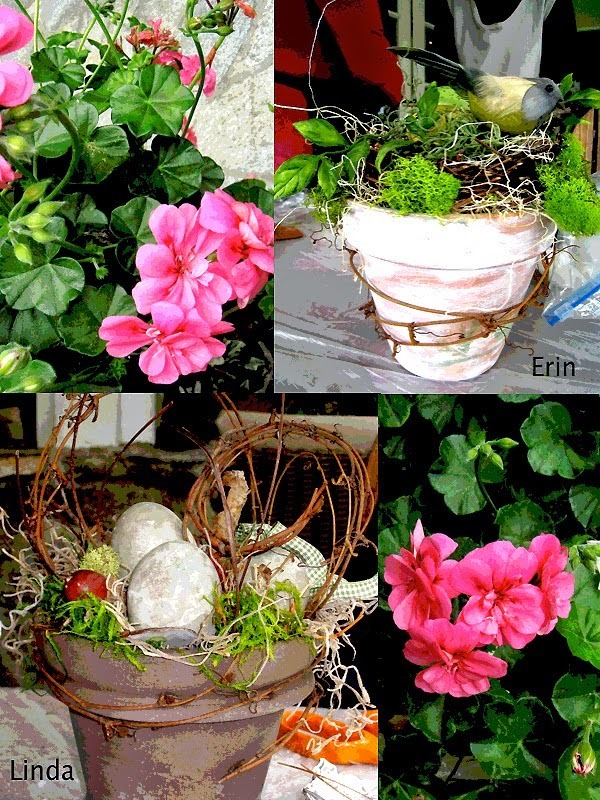 Erin, I love the pots, eggs, nests. Everything is so pretty. Ohhhhhhhhhhhhh, I wish Jody would have invited me. Those eggs are absolutely adorable. Maybe next time? Pray tell ... how in the world do y'all play in concrete wearing bracelets and manicured nails? I would have that concrete everywhere. LOVE me a Libby pinecone. Amazing. 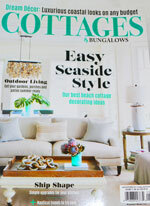 I can't wait to read all about the Balboa Island Art Walk - I just know it's going to be spectacular. 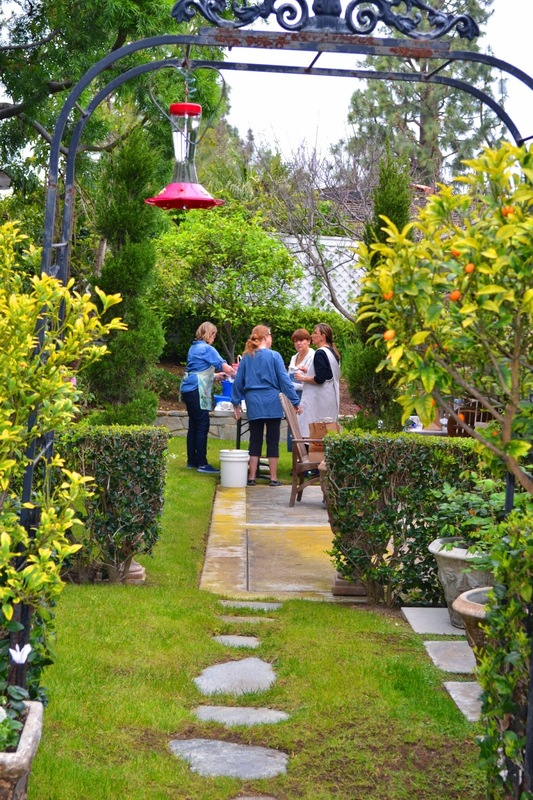 I loved seeing Jody's garden and all the fun Easter goodies you ladies worked on. I want to try the eggs, nests and pots. You are such an inspiration for me. 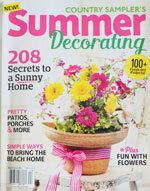 I can't wait for Spring, so in the meantime, I will be getting ready. 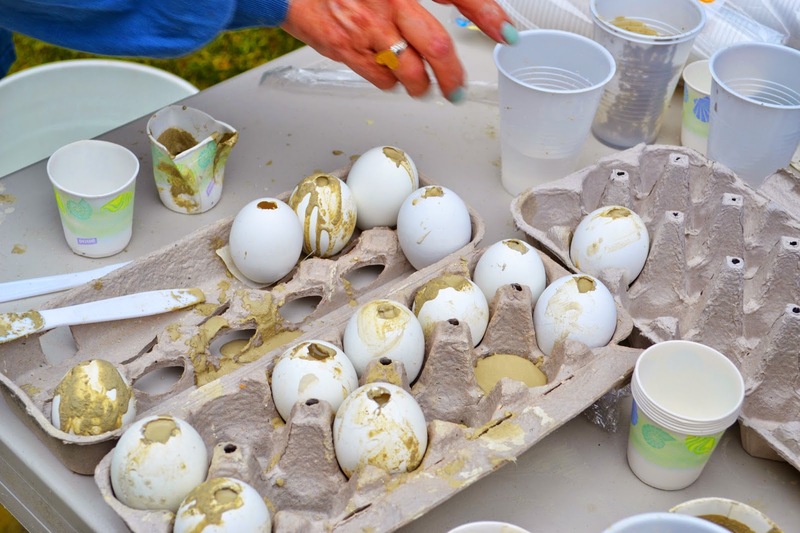 I want to try the eggs using the plastic ones as a form. Maybe it'll work. Thanks for sharing your fun! Erin I love the pots, eggs, nest. Everything is so pretty. 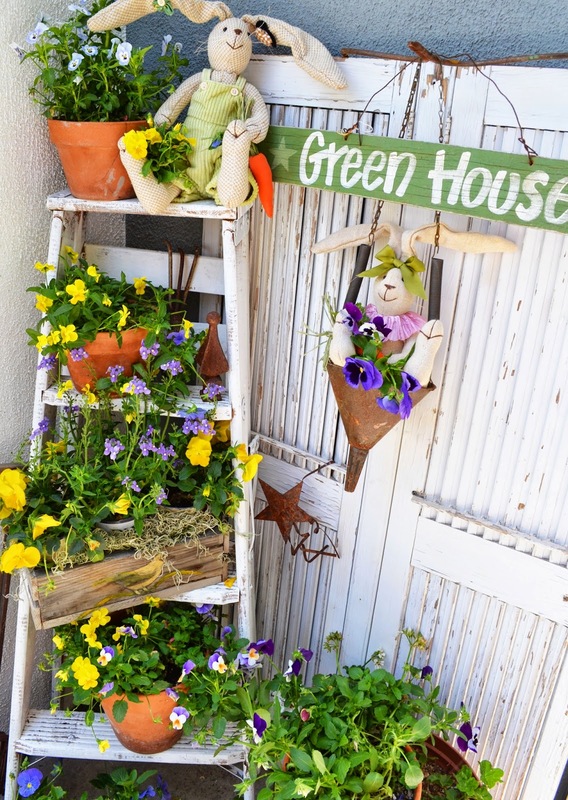 You have amazing garden and this project looks like so much fun! All nests and eggs are so beautiful! Every post from you brings such joy, you're such a talented and uplifting lady! I prayed for a very successful art show for you and the show over all.